I know how much you enjoy my little science lessons, and I enjoy giving them! As always, please remember I am not a doctor or scientist of any kind. I just try to simplify this disease and process to the best of my ability, which helps me and I have had reports that others find it helpful to be able to see and understand what we are going through. There are a lot of unknowns in this whole story, there are many questions and so many non-answers. Sometimes we just don't know. Cancer doesn't really come in a nice tidy list and schedule. Blood counts and chemotherapy and surgeons and we are all humans and human bodies do whatever they do sometimes. During this treatment, we have been asked several times to sign papers for research, which we do. They are still studying osteosarcoma, and since he has it, we might as well help advance science! Remember back in the day we learned about cells and they reproduce to make new skin and bones and we made jokes about in seven years we will be a whole new person? So that's where we start. Cells. They divide and make new stuff. Happy little cells. There they are, happy dividing cells, doing their thing. Dividing. Making some bone. Everything's fine. It's normal. Everything is cool. In pre-teens and teenagers, sometimes these kids grow really fast, and the cells are making new bone and skin and trying to keep up with puberty. The bone cells are dividing as they should, making new bone, having a party and super excited about making this nice tall teenager. Usually, these cells have to go through Customs and Border Patrol and get checked out along the way, pass some toll booths and make sure all these cells are paying attention to the rules. In all of our bodies that don't have osteosarcoma, the bone cells have all followed the rules. With Osteosarcoma, those cells have just blasted through customs and the toll booths and they are bringing friends. When we grow, the cells produce rapidly. 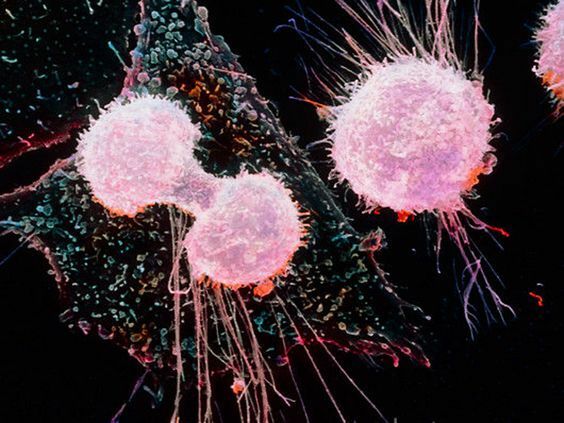 Cancer cells also reproduce rapidly, but they have really lost their way, making mistakes as they try to build bone, but they have become completely out of control. One of the consequences of out of control cell growth is cancer. This cancer is osteosarcoma. Those cells then start making a tumour. A lot of times, we think of tumours as things to be removed, like brain tumours... get that sucker out of your brain! It needs to be removed. And that happens a lot - like with brain tumours, we don't just get our brains removed. We aren't zombies. Unfortunately, with the bone cells going all wackadoo trying to make bone, they've really messed up and what was supposed to be nice shiny new bone, is now actually a tumour itself. It's not a tumor that just grew on top of a bone and they can open him up and scrape this tumour off. By this point it's causing a great amount of pain and his bone is weak and fragile. Atticus walks on crutches because of the pain and also because the bone is so weak, they don't want him loosing balance or breaking it, which can then spread the cancer cells quickly through his body. They immediately start the chemo treatment, as chemotherapy kills off those rapidly reproducing cells. Get those cancer cells under control before they start taking over the whole body. They want to see some serious necrosis of that tumour. After 10ish weeks of chemo, the treatment plan calls for a limb salvage surgery. That is when they will take most of his femur out, send it to pathology and they see how well his tumour has responded to the chemotherapy. Growing prosthetic! 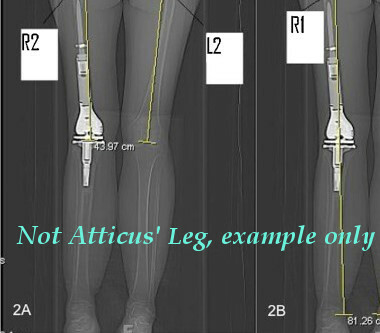 Because Atticus is not done growing, they replace his distal femur with this growing implant. He will walk lopsided at times as his right leg grows, then they do minor surgeries and extend the implant and even him out. They can only extend it little bits at a time because of the muscles and nerves and ligaments need to grow slowly to catch up to the implant. When he is finished growing, the growing prosthetic will be replaced with a more permanent, stronger femur implant. The tumour and it's bone go to pathology and the super scientists cut it up and look at it under microscopes and then report back to the surgeon and oncologists and let them know how the tumour has responded to the chemotherapy treatment. If he is a good responder, chemo lasts until around autumn, and if not, then it goes on for much longer. As always, one step at a time. One day at a time, sometimes, we just need to make it one minute at a time, because sometimes, we have some really, really difficult minutes. Keep us in your thoughts, remember to share Joshua's GoFundMe on all of your social media channels as I am currently unemployed to care for my son and of course daughters who are all struggling in their own ways. This is more than a full time job for me, with overtime and some pretty big emotions. Thank you as well for all of the fun little care packages and cheerful gifts along the way. It helps make a really difficult time a little brighter.